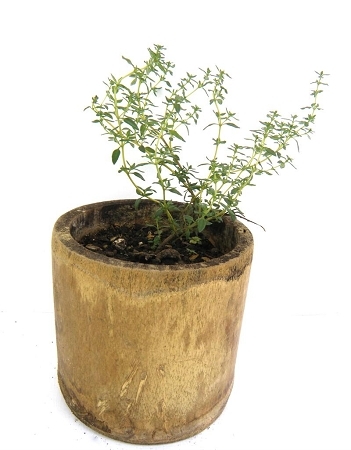 (Thymus vulgaris) This highly aromatic thyme herb plant has been grown organically and comes in a reusable bamboo pot. A Mediterranean herb, it grows especially well in somewhat dry, sunny conditions and takes on a sprawling habit. Thyme leaf is great used in chicken or vegetable soup. It is also medicinal for the lungs. When eaten, it prevents bacteria from growing in the lungs. Tea made from thyme is quite tasty and medicinal as well. Thyme is rich in iron, manganese, phosphorous and many other minerals.